The Dwarfs escaped the destruction of the Warhammer World on fragments of the planet and they have now returned to scour the mortal realms as relentless berserk warriors. The Fyreslayers are Duardin who search the realms for the shattered remnants of the God Grimnir. But what these noble fighters lack in height they sure make up for in the ferocity of their attack and the skill they wield their battle axes. Becoming mercenaries that will sell their grim services to anybody with enough ur-gold, they have a fearsome reputation and honour to uphold their oaths. They complete their hired tasks with murderous efficiency and pursue any fool that shirks their payment. They burn with spiritual fervour and channel the berserker rage unlike any other, so pray you do not get between them and their ur-gold. Fyreslayers are born from the furnaces deep within mountain vaults, bellowing mighty war cries as they charge in to the fray swinging their deadly battle axes. They carry little in the way of armour to protect themselves, instead blessed with the power of their God magical ur-gold runes that are seared into their flesh, allowing their God's power to flow through their veins and provide them with abilities of more resilient skin and increased strength to cleave their enemies in two and shrug off wounds that would slay a normal warrior. What drives the Duardin Fyreslayers ever on is the promise of gold to be won, to fulfil their oaths by vanquishing their enemies and the chance to honour the spirit of Grimnir. 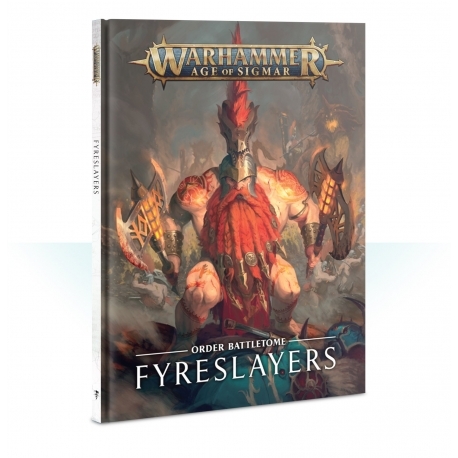 Battletome: Fyreslayers is a hardback book that is an essential guide for any collector. Covering background, history and beautiful artwork as it delves into the world of the red-headed berzerkers. One Hardback copy of the Battletome: Fyreslayers supplied in English. By buying this product you can collect up to £ 0.21 with our loyalty program. Your cart will total £ 0.21 that can be converted into a voucher.